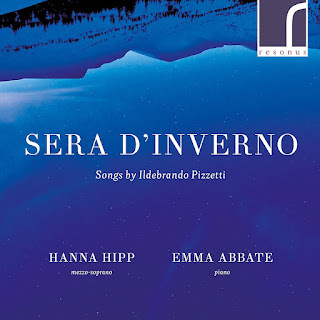 The music of Ildebrando Pizzetti is gradually finding its way into our consciousnesses, and this enterprising new disc from pianist Emma Abbate (whose previous recital was a disc of Mario Castelnuovo,-Tedesco's Shakespeare settings, see my review) and mezzo-soprano Hanna Hipp presents around half of Pizzetti's songs in a wide-ranging recital on Resonus Classics which gives us a clear sense of the composer's rather distinctive take on the song genre. Ildebrando Pizzetti belonged to a group of composers referred to as the generazion dell'ottanta (the generation of eighty) referring to their birth in the 1880s; the group included Franco Alfano, Ottorino Respighi, Gian Francesco Malipiero and Alfredo Casella. The group was notable for being the first generation of Italian composers not to automatically write opera and all would write in a wide variety of genres, and break away from traditional Italian styles. Of the group all but Pizzetti spent a period studying outside of Italy. Pizzetti's attitude to songwriting was very definitely non-traditional in Italian terms, and the 17 songs on this disc exist in a very distinctive sound-world which owes little to the songs written by previous generations of Italian opera composers. This is complex art-song where music and text are fused. Pizzetti placed a strong emphasis on the text and was interested in getting the right setting for the text, thoughtful settings which ensure that the poetry is well served. He eschews traditional melodies in favour of vocal lines which follow the inflections of the Italian language, the resulting songs are remarkably complex pieces which could hardly be mistaken for the work of anyone else. Texts are quite varied, coming from both ancient and modern texts including quite a number by Pizzetti's contemporaries such as Gabriele D'Annunzio and Giuseppe Ungaretti, but also lesser-known figures such as Mario Silvani (who was from Pizzetti's home-town of Parma). The vocal lines are fluid, arioso-like with a strong sense of the poetry underneath. 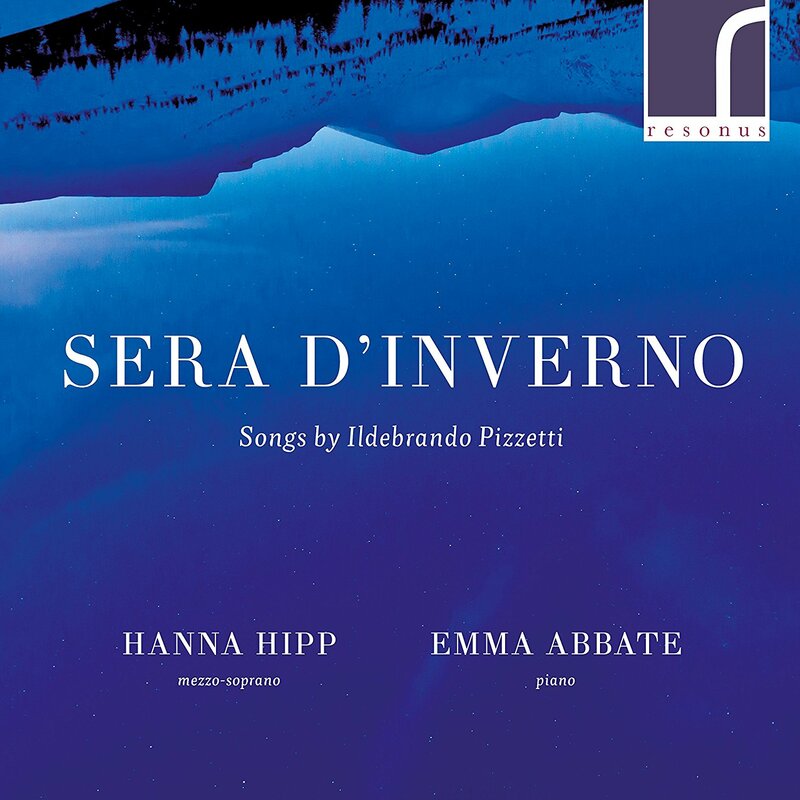 Not for Pizzetti the subservience of the poetry to the melodic structure, and these vocal lines are complemented by remarkably complex piano parts which support and complement rather than just accompanying. The resulting description might make the pieces sound worthy or even boring, but once you adjust to the rather conversational sound world there is much to enjoy. Pizzetti allows moments to flower, following the emotion of the texts, and the piano provides a real commentary on the music. Hanna Hipp sings with a lovely bright tone and a real radiance in the more passionate passages. She sings the Italian admirably, but I can't help feeling that with the emphasis on the text a native Italian speaker could not have been found. Emme Abbate is fine accompanist and partner, making Pizzetti's complex and sometimes dense piano parts work well. There is an admirable essay introducing the songs and texts and translations (except for a couple where I presume copyright issues intervened), but there does not seem to be any way of telling which song was written when. These are not easy songs, and it is all too easy to imagine a performance of them which would fit into the worthy, dull or even undesirable categories. But here Hipp and Abbate make real music, the songs flow fluidly and have moments of great beauty and real radiance.